Few places on Llyn have the same mysticism about them, as the small creek of Rhuol. Situated at the western end of Hells Mouth, and nestled under the steep hills of Rhiw. “Porth y Rhiw” as it was once called, was through the centauries a very important place for the village and it’s people, as a source of food from fishing, and a gateway to the outside world. It had all the makings of a small but thriving port; at one time a ferry would call here from Barmouth, cutting out the arduous overland journey. Ships were built here on a slipway, many more I suspect than the five, which are recorded, since records began in 1776. It had a limekiln, which was firing up to the 1900’s, and coal came in by the shipload. There were three water mills in the vicinity as well, one just up the hill from the cove, and no doubt grain must have been imported, to feed their hungry grinding stones. The little ships would export eggs, poultry and meat, for the markets of Liverpool and beyond. Rhuol’s tavern “Tyn Borth” must have enjoyed a thriving trade at these times, quenching the thirst of its traveling clientele. One can only imagine what it was like inside; dimly lit by oil lamps and the glow of a roaring gorse fire, drinking smuggled wines porter and brandy, from dented pewter jugs and cups, singing sea shanties, and listening to tall stories or poetry, the clanging of ale jugs, and some enjoying fresh bread and cheese, in fact the fun and laughter of a typical water front tavern. Rhuol, was without doubt used extensively for Smuggling as well, and an example from June 1824, bears this out. A schooner on her way from Guernsey to the Clyde called at Rhuol and offloaded lace, tea, brandy and gin, she is said to have stayed there for days. Richard Edwards the squire at Nanhoron wrote to the customs complaining, that if their cutter were at St Tudwals roads instead of Pwllheli, the smugglers would have been caught. “Having the cutter at Pwllheli is a waste of time” he said, “She might as well be stationed at Charing Cross!! 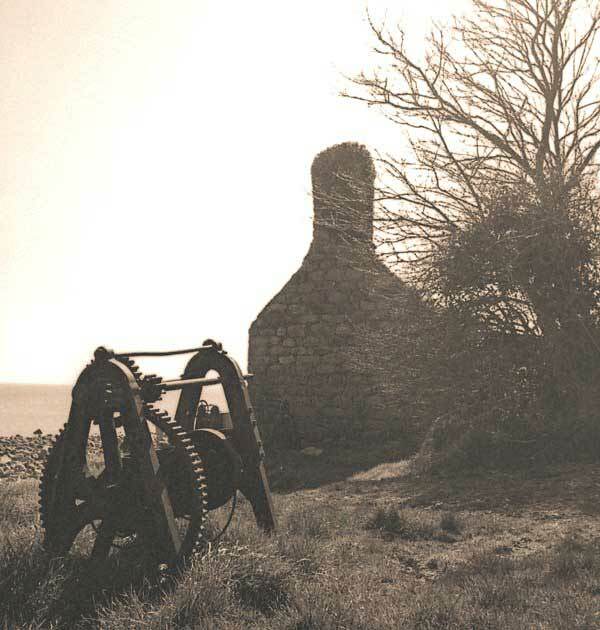 !” Rumour has it of a tunnel from the woodland above the cove, all the way to the cellars of Plas yn Rhiw, some quarter of a mile away up the hill, where smugglers use to take their booty, for their ready market. There was also a darker side, there have been two accounts of wrecking at Rhuol, and probably many more that haven’t as yet come to light; the first in 1629, when an anchored French vessel fell victim, a gang of cut-throats boarded her, and spared no one, they were all tossed over the side, after robbing them, and even cutting their ears and fingers off, to get at their expensive jewellery. And the attack by several men in January 1742, was just as gruesome, this left two defenceless shipwrecked mariners dead on the beach, and robbed them of their meagre belongings of blankets and cutlery. 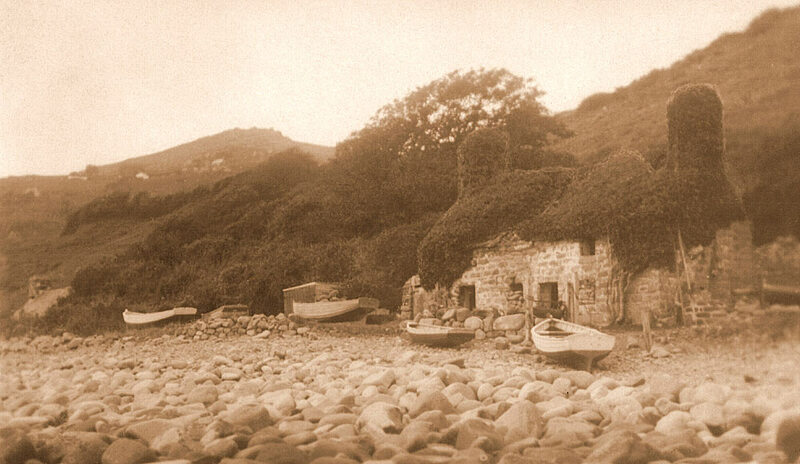 When the ships stopped coming, with the advent of better roads and transport, Rhuol once again reverted to a little fishing cove, gone was the hustle and bustle of a busy port, to be replaced by a flotilla of smaller craft, owned by crofters and farmers, but these after many decades have also gone. 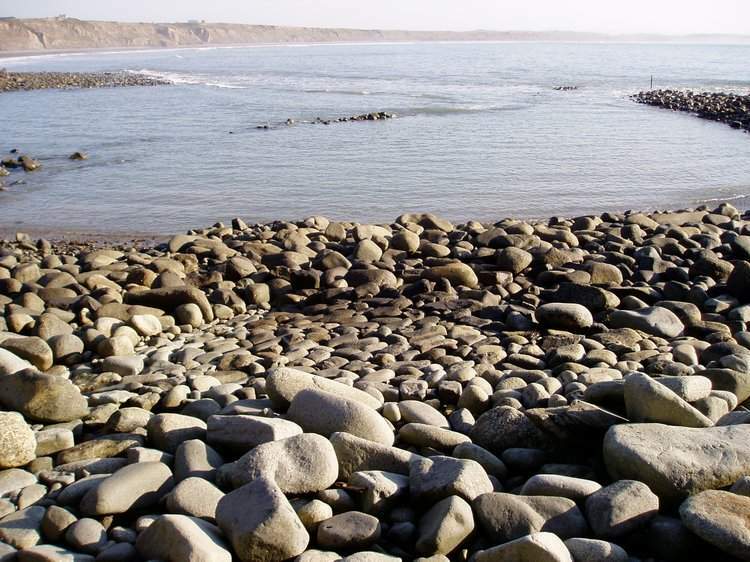 And Tyn Borth once the hub of the area, became a home, during this time an Italian vessel with a cargo of timber was wrecked on their doorstep, the family kindly took the survivors in, some stayed for a while, and the children of the house ware taught Italian by their guests. Then a storm in the early 1900’s flooded the dwelling, and the little family were forced to move out. Sadly today all that is left at Porth y Rhiw is a silent ruin, an empty slipway and a couple of modern lobster pot dories. 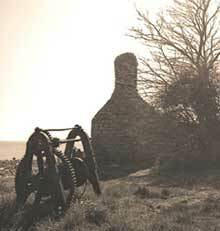 Two accounts of life at Rhiw when Rhuol was a thriving fishing port.